Despite the intense heat that is August in Tokyo, it seems like there is loads happening on the gardening and growing front. I've not finished writing about our trip to Hokkaido camping and cruising local foods there, but it seems all around me here something needs to be planted, harvested, or readied for the next round of growing. Again, I'm learning that vegetables wait for no one! And the same seems to be true of fruit. 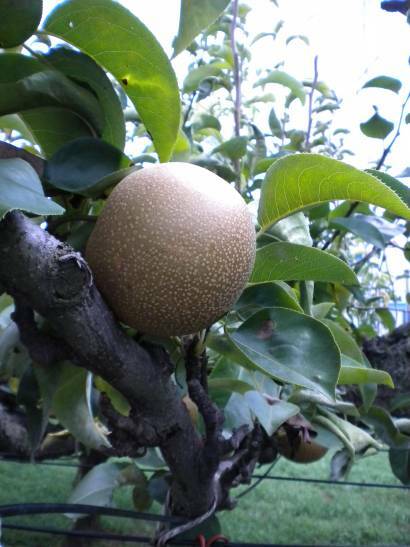 The nearby nashi (Japanese pear) orchard that I photographed in blossom this spring has set an abundance of fruit. I can almost taste those fat orbs now with their crisp apple-like flesh and subtly sweet flavor that refreshes like no other. I'm hoping to experiment with some nashi jam or butter this year to see what happens. Perhaps I'll even mix it with some of my balcony peppers for a sweet-hot something or other....Oh, the possibilities! Those pears look very yummy! You know when i just got to japan they gave me some pears but i tought they where apples. That until i tried of course. I like the flavor, its not at sweet as americans but they feel more fresh. I had a pear ice cream last week it was Goooood! I'll look forward to that recipe! Pear ice cream sounds great. It's one of our favorite fruits here, for sure.